You always remember your first time. It marks a rite of passage. For some it's a pleasant memory. For others it's a little harsh. 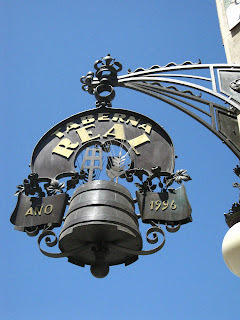 You can imagine my surprise today when I was walking home from shopping the Rastro (Madrid's 500-year-old flea market) and turned a corner to find myself in front of the very spot it occurred: La Taberna Real. It was almost startling and definitely emotional. All the details of the event came flooding in. . . . I was with my mom at the time. Wait. . . What?! . . . What did you think I was talking about? . . . I don't know where your mind is, but I was referring to the first time I tasted orujo de hierbas! It was 2005 and my first trip to Spain. It was actually my first day in Spain. It was a gloriously sunny and warm June day. My mom and I had just landed and were embarking upon a 2 week gastronomic tour. We were a little bleary-eyed but too excited to rest. Our friend and guide, Genevieve of Cellar Tours, took us for a little walking tour of Madrid near the Palacio Real. We did need a little liquid sustenance, so upon Genevieve's suggestion we popped into the Taberna Real. The first thing you notice when you walk in is this beautiful candelabra hanging from the ceiling. Not exactly your typical bar decor. Genevieve took the liberty of ordering for us. You can image our surprise when tiny shot glasses of neon yellow liquid appeared. We toasted to our gluttonous trip ahead (with countless wineries and Michelin-starred restaurants on the agenda) and sipped on our orujo de hierbas, which is affectionately translated as "firewater from herbs." Being from the South, I've had my share of grain alcohol so was skeptical at first. But I really didn't think a luxury tour company would be pushing the Spanish equivalent of moonshine down our throats. Orujo de hierbas is a Spanish liqueur made from the solid remains of grapes after pressing. It's quite high in alcohol (100 proof), so a little goes a long way. It has a distinct herbal bouquet to it, which I know sounds like potpourri but thankfully doesn't taste like that. I can still recall that very first sip. It is typically served cold but with the high alcohol content you get both a refreshing and enkindling effect on the way down. It has a perfect balance of sweetness and acidity from the herbs, with a slight undertone of anise. You're left with this amazing soothing after-effect, which you can feel all the way down in your toes. You can literally feel it moving through your body. I can see why it's such a popular digestif. In many ways, it felt like a little initiation. We'd crossed some threshold and were now a little closer to the spirit of Spain. It was a wonderful start to an amazing trip, and also began a ritual of una copita de orujo at the end of each day. No matter how much we ate or drank, we always felt like a million bucks the next day. I'm giving all the credit to the orujo! So today when I happened upon the Taberna Real, I couldn't help but wander in, take a seat at the bar under the beautiful candelabra, and order a little shot of orujo. I took a sip, and the memories of my first time came pouring in. For me, orujo encapsulates Spain. It's colorful, energetic, and warm, but leaves you relaxed and with a smile on your face. It does something good to your soul. And that is exactly how I felt as the fiery liquid ran through my body. I've made a wonderful discovery in Madrid. The locals call it tinto de verano, but I call it Quite Possibly the Most Perfect Summertime Drink. 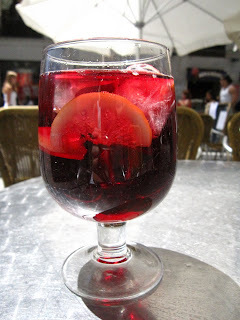 It's similar to sangria and is served all over Spain in the summer. It's 1 part red wine and 1 part La Casera, which is Spain's version of Sprite but less sweet. To replicate it, a bartender told me you could mix Sprite with seltzer or club soda. He also swore to me that it tastes best when cheap wine is used. Pour into a glass filled with ice, add some lemon slices and take a swig. You'll soon see what I'm talking about. 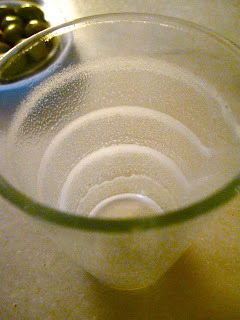 It just doesn't seem like a simple wine spritzer could be that refreshing and delicious, but this easy-drinking cocktail is the ideal liquid refreshment for a hot summer day. It's actually quite easy to throw back several. I think drinking it while sitting in an outdoor cafe in Spain only improves the taste, but I wouldn't say it's a mandatory ingredient. I know you've probably got a bottle of Two Buck Chuck hanging around the house, so crack it open, pour in some club soda and savor the summer.
. . . Sardines . . .
. . . and of course Cerveza! Low and slow. Is there a finer way to cook pork? My argument was further cemented when I had the chance last weekend to visit Segovia, home of the roasted suckling pig. Segovia (about an hour north of Madrid) is an enchanting town, with twisting alleyways, pedestrian streets, and beautiful vistas. The locals are known for being perpetually happy. How could they not with the enticing aroma of suckling pig around every corner? It's not unusual to see an impromptu concert with dancers or a little parade. No special reason. It's just another day in Segovia. After a bit of sightseeing, I could no longer resist the intoxicating scent and begged my travelmates to stop into restaurant Jose Maria, a spot known for their cochinillo asada (roasted suckling pig). I'm not sure why the waiter even bothered with menus as it would be near sacrilege to eat something else. When our meal was presented to the table, it came out whole. I know it's a little piglet but I promise once you taste the succulent meat that literally melts in your mouth you're immediately transported to a happy place. But the true sign of tenderness is demonstrated by the waiter cutting the whole pig up table side — with a standard dinner plate. It's the signature ritual of a good restaurant. By roasting it "low and slow" for hours with a simple olive oil basting from time to time, the skin has the most delicate crunch to it, and the meat is incredibly juicy. I've never tasted such sublimity. With full stomachs, we continued our exploration of the town. Having been a trading center under the Roman Empire, Segovia reached its period of greatest splendor during the Middle Ages and is well preserved today. 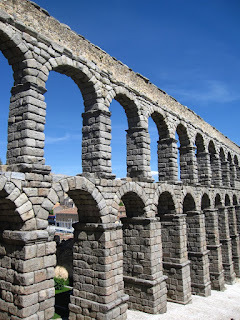 The Romans' most distinct mark is a still functioning aqueduct that stretches from the walls of the old town to the edges of the Sierra de Guadarrama mountains, about 11 miles away. It was built at the end of the 1st to early 2nd century AD during their occupation of the Iberian Peninsula. What an engineering marvel! It has 166 arches and 120 pillars in two levels, and is comprised of 20,400 rough-hewn granite blocks joined without mortar or clamps reaching a height of 100 feet. Another beautiful sight is the Cabildo Catedral, which is the last Gothic cathedral built in Spain and fronts the Plaza Mayor. Although not Catholic, I have to admit I did go inside and say a little prayer that I would one day be back in Segovia to savor its suckling pig.